KUWAIT CITY, Sept 24: The National Assembly on Monday hosted the Nationalization of Jobs and Human Resources Investment in GCC Countries Conference under the patronage of Speaker Marzouq Al-Ghanim with the participation of concerned governmental authorities and members of legislative authorities in GCC countries. In line with the decision taken by GCC National Assembly speakers during their 11th meeting in January, the conference seeks to highlight the importance of nationalization of jobs and investment in human resources. Members of legislative authorities from Bahrain, United Arab Emirates (UAE), Qatar and Oman shared their legislative experiences in addressing the issue. In his opening speech, Chairperson of the Kuwaiti Parliamentary Division MP Rakaan Al-Nusuf asserted all GCC countries are facing the same issue. He pointed out these countries need to address numerous legislative and executive concerns, indicating the conference focused on the academic definition of nationalization. He said every participating country shared their experiences in addressing the issue in a bid to build a more comprehensive and effective course of action. On the other hand, Head of the Budgets and Job Classifications Department at the Civil Service Commission (CSC) Aisha Al-Mutawa explained the replacement of foreign workers with Kuwaitis is just part of a series of measures being taken by the government to solve the employment crisis. She said the replacement policy is currently being implemented in some governmental institutions with the aim of reaching 100 percent Kuwaiti workforce in most job categories. As of fiscal 2017/2018, the number of Kuwaiti employees in the public sector reached 244,162 while their expatriate counterparts totaled 44.572. The number of expatriate workers whose contracts ended due to this measure reached 3,140 as of July this year and more contracts will end by fiscal 2022/2023, she added. Furthermore, MP Mohammed Al- Dallaal proposed during the conference that the GCC should adopt the European Union's policy on free employment between member countries. He believes this will greatly contribute to ongoing efforts to address the employment crisis and ensure integration in the region. He said the State of Kuwait encountered a problem with the private sector as the latter does not give Kuwaitis job security; thereby, pushing them to seek jobs in the public sector. He thinks other GCC countries are facing the same problem, so he called for activating the private sector's participation in this endeavor. Moreover, representative of the Manpower Development Department at the Manpower and Government Restructuring Program (MGRP) Tareq Al-Kandari revealed that one of the issues they are currently facing is the unprecedented number of national professionals in the job market; hence, the difficulty in finding appropriate jobs for them. This has prompted the program to exert tremendous efforts in coordinating with the private sector to determine the actual demand of the labor market in order to provide the necessary training programs for job seekers, he disclosed. He went on to confirm that MGRP has vast experience in training job seekers and employees to develop their talents and capabilities for them to remain relevant in the job market or their current jobs. 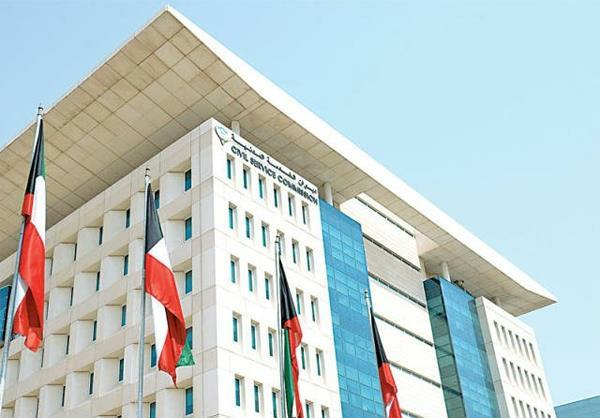 The government has, meanwhile, placed a ban on the transfer of expatriates from the private to the government sector, except in cases where written approval is obtained from the CSC, reports Al-Anba daily. The sources explained in such cases the employers of expatriates in the private sector must submit a document stating the approval of the CSC to the Public Authority for Manpower. The sources said the approval of the CSC applies to 48 institutions including ministries and government agencies which fall under the umbrella of the CSC. The approval is not applied to those institutions with special regulations. The sources revealed this step comes in line with the implementation of the replacement policy, which is one of the basic treatments to adjust the demographics. The sources pointed out the decision to amend the demographics has produced excellent results and led to a decrease in the number of expatriates working in the government sector to 41,000 who work in 48 government institutions, including 25,000 teachers and 16,000 porters. This is besides the grave diggers, accountants, legal personnel and typists, in addition to 34,000 doctors and nurses and lab technicians.